It has probably been three or more years since I first received my DNA test results that I ordered through Ancestry.com. Initially, I was very disappointed with the look and feel of Ancestry’s DNA feature–it merely showed (based upon my DNA sample test), that I descended from Europeans who had migrated to the New World. Now, the only way I wouldn’t have already known this was if I had been an ostrich with its head buried in the sand for the past 400 or so years. Over the past 18 months or longer, Ancestry has continued to add, or in its opinion, improve to its list of features like its “life story” option which assimilated facts from my collected documentation in my family tree to general historic timeline narratives of events in close proximity with a given fact. It was a good try, but, in my opinion, something I preferred to research and narrate on my own with more specificity, if and when I chose to do a write about an individual. Then, this week, Ancestry sent me an email announcing more new features to help me better connect my people and my places to historical details and migration paths. It seems AncestryDNA™ has become the largest consumer genetic testing company with 3,000,000 people tested; 80,000,000 trees; and 19,000,000,000 records. 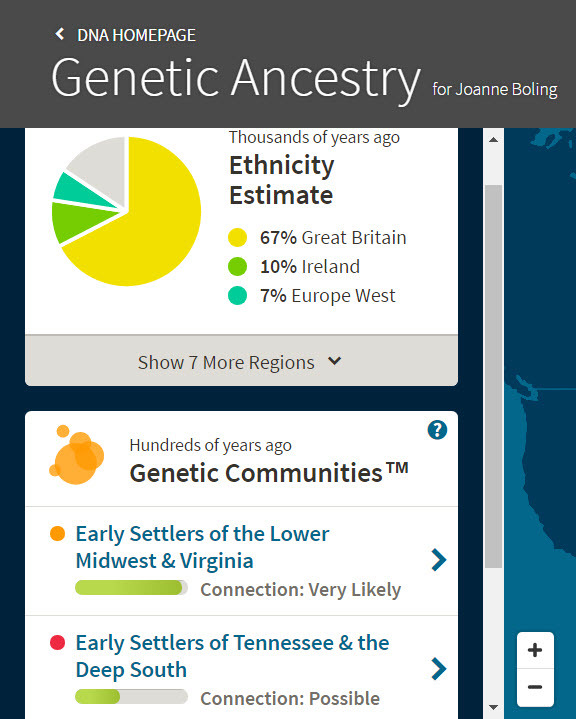 And this time, Ancestry uses its vast collection of DNA results to tap into its family history resources and create an all-new feature “Genetic Communities™,” which in turn helps me fill in missing pieces about my family’s story and how it inter-relates to the geography, times, and stories of other families. Earlier results broke down my ethnicity origins into a mere four regions of the world. With today’s results (that will continue to grow over time since this feature is in its Beta version), I can browse over 300 Genetic Communities using MapBox open source geospatial maps that Ancestry integrated into this new feature. So Just What Is A “Genetic Community”? Ancestry describes a genetic community as a group of AncestryDNA members who are connected through DNA most likely because they descend from a population of common ancestors, even if they no longer live in the area where those ancestors once lived. The image below shows that my ancestors and I are part of two genetic communities in which our connection is very likely or possible: Early Settlers of Lower Midwest & Virginia and Early Settlers of Tennessee and the Deep South. And further, below is just one of six time-line examples within the “Early Settler of the Lower Midwest & Virginia” Genetic Communities™: (1700-1775 “Into the Back Country,” 1775-1825 “Kentucky Fever,” 1825-1850 “Along the Mississippi,” 1850-1875 “War Hits Home,” 1875-1900 “The South Industrializes, 1900-1950 “An Urban Life,” in this new feature. Although not shown as links, you can click on each name from your tree and it will display this person on the MapBox map, (which you can zoom in or out of for greater or less geographic detail); and you can also click another link that will allow you to view each person’s profile details from inside your Ancestry family tree. By 1700 flourishing towns and small cities dotted the eastern seaboard from Massachusetts to North Carolina. Many new immigrants from England and Germany, and Scots-Irish from northern Ireland, pressed into the rugged country to the west where they could find land, religious tolerance, political freedom, and economic opportunity. They faced threats from the French on the other side of the Appalachian Mountains and native peoples who resisted encroachment on their lands. Bottom line, I am enjoying browsing and navigating the “Genetic Communities” feature because I always wanted to geographically place my ancestors together along a timeline to see their proximity to each other and how their lives might have been the same or dissimilar. If you are an Ancestry.com customer, who hadn’t yet heard about Ancestry’s newest feature and its options, I hope you will check it out and let me know what you think.